Can I be honest? I have not exactly been the poster child for "healthy food blogger" lately. I can blame it on time or stress or hormones or any other excuses, but my reasoning doesn't really matter...I simply haven't been as healthy as I like to be. Sure, I still pack all of my lunches ahead of time, fit in my fruits and veggies, and cook some nutritious dinners throughout the week, but there's been a lot of "guilty pleasures" consumed. Including, but not limited to, french fries, chips, cookies, nachos, burgers, and some damn chocolate sea salt caramels from Christmas that weren't gonna disappear on their own. Indulging in my favorite treats is nothing new to me, and something I pretty much must do a couple times a week, but it's been more often over the past couple of months. The interesting thing is, I haven't noticed any changes body- or weight-wise. Since I've started working out more (and strength-training specifically) and eating "clean" most of time, fluctuations in the strictness of my diet don't seem to contribute to much fluctuation in my weight, which is nice and all, but I certainly don't feel great after eating like crap. More important than what I look like, I love the way I feel when I eat healthy, and I love to be nice to my body. I haven't been consistently nice lately. I'm not telling you this because I have a big goal or resolution to be totally consistent in my healthy eating. Because at this point, I'm not sure I do. I'm going to keep taking it day by day, always making sure to at least give my body the nutrients it needs. I think I'm telling you in order to "come clean": I'm so far from perfect. I share all of my healthy recipes here because they're usually my favorite and they're usually the most "impressive" and I think they're what my readers like best. But I'm not eating this way 100% of time. If you're not either, don't fret. My stance is that our bodies don't necessarily need perfect. Our bodies want nutrients from veggies and lean protein and fruits and whole grains and healthy fats. If you have a cookie on top of all of that? Not gonna kill ya. Especially if you're working out too! Moderation, moderation, moderation. Like I said though, healthy recipes are my favorite to share because they're often my favorite to eat! This pan-fried chicken with poppyseed honey mustard sauce was so delicious. This is one of those meals that satisfies a craving for decadence while still leaving you feeling great. 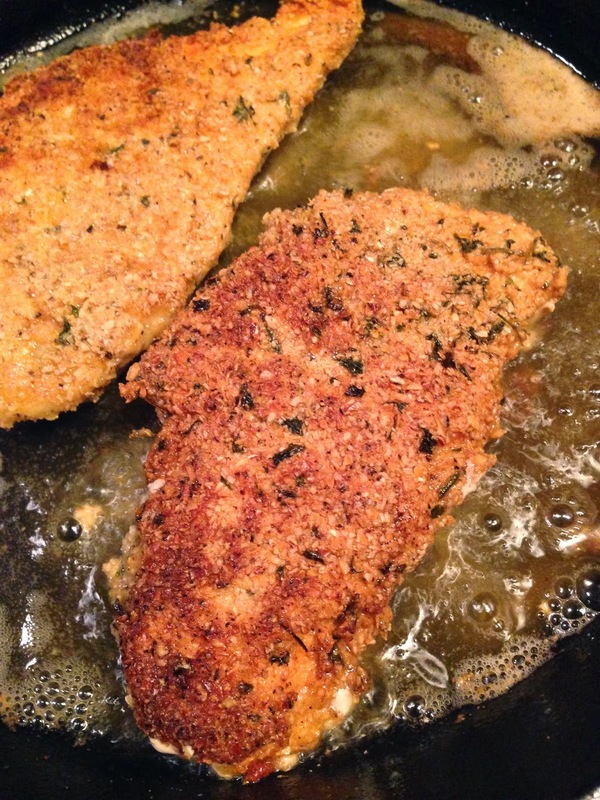 The crispy crust is achieved from pan "frying" the chicken in olive oil after dredging it in egg wash and oat flour. 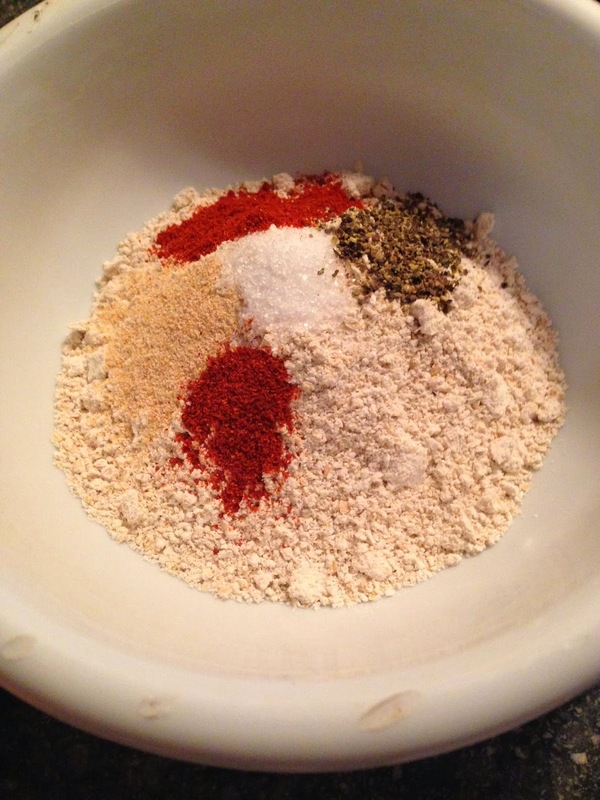 We add plenty of spices so that the crust is reminiscent of fried chicken, not oats. 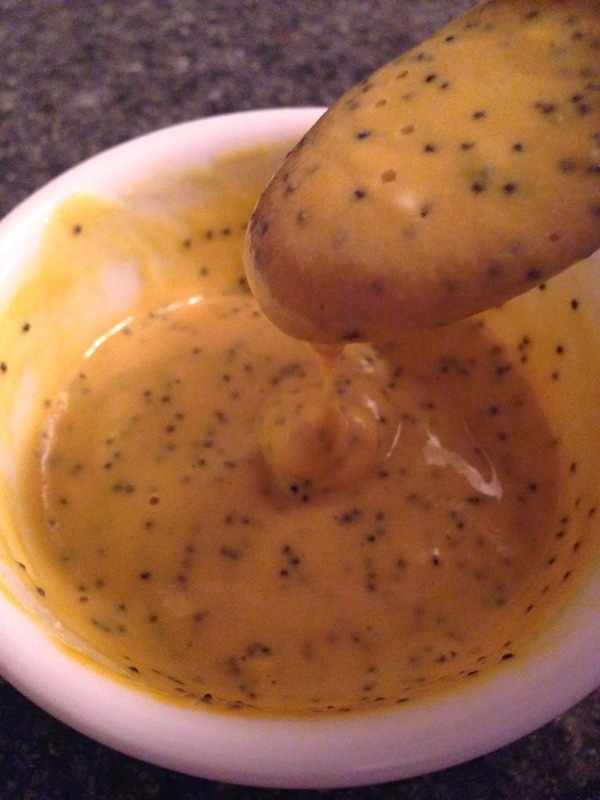 Then we top it in this creamy, glorious poppyseed honey mustard sauce that is made from totally healthy ingredients. Tender inside, crispy outside, flavorful and creamy sauce. Yum. All in all, this meal is totally guilt free. Low calorie or low fat? Maybe not, but made entirely of clean and healthy ingredients, which is more important to me. It's easy to make too, and you can have it ready in 20 minutes. Seriously! 20 minutes. With this meal, you don't have to choose between healthy and delicious. It's both. 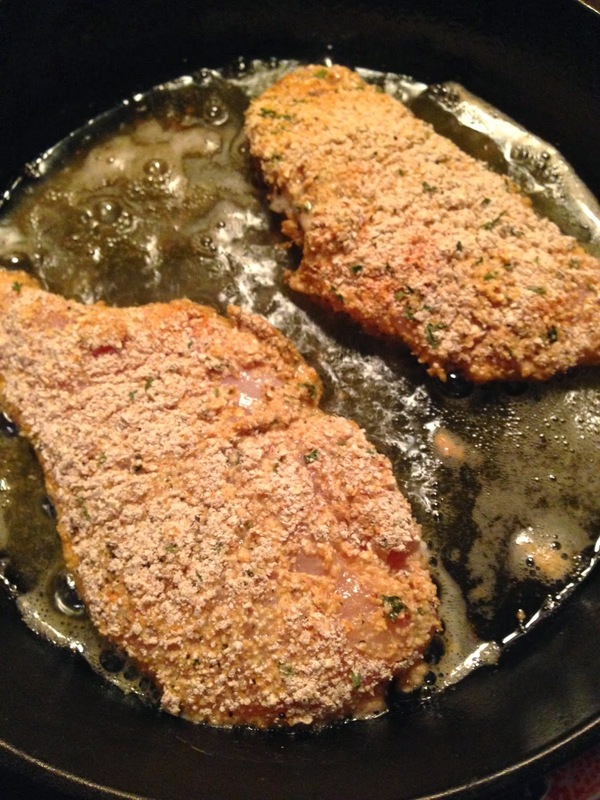 You'll feel like you're eating pan fried breaded chicken, but you won't feel heavy or weighed down afterwards. 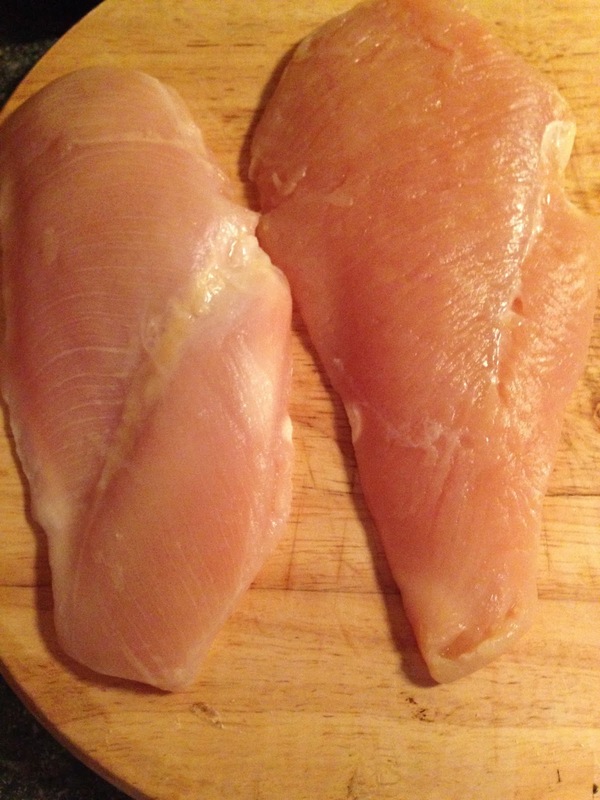 Pound 2 chicken breasts thin and even (or start with already-thin breasts). If you don't have prepared oat flour (I never do), place 1/2 cup of old fashioned rolled oats into a food processor and grind until fine, about 30-60 seconds. Then, mix with your spices: 1/4 tsp each salt, pepper, garlic powder, and paprika; 1/8 tsp cayenne; and 1 tsp dried parsley. For your egg wash, whisk together 1 egg and 1/4 cup of almond milk or other milk. Cover the bottom of a heavy-bottomed skillet (cast iron definitely preferable) with extra virgin olive oil. Heat over medium high heat until very hot, about 5 minutes. To make sure it's hot enough, toss a small crumb into the oil... if it sizzles, you're good. If not, keep heating. Then, dredge your chicken. Take each chicken breast and first coat with the oat flour. Then, coat with the egg and milk mixture until covered. Then, return to the oat flour and coat well again. Carefully place in the hot oil. Repeat with other breast. Cook the chicken until browned on the first side, about 5 minutes. Don't touch while it's cooking! Then, flip and cook until browned on the other side and cooked through, another 4-5 minutes. When it's done, place on a paper towel-lined plate. Meanwhile, prepare your sauce: whisk together 1 tbsp plain greek yogurt, 1 tbsp yellow mustard, 1 tbsp honey, and 1 tsp poppyseeds. Then, slowly pour in 1 to 2 tbsp of almond milk, until desired consistency is reached. Drizzle the chicken with the sauce and serve immediately. Don't wait -- it tends to get soggy as it sits. Eat it while it's crispy! -Pulse the rolled oats in a food processor until finely ground, about 30-60 seconds. If you have prepared oat flour, skip this step. 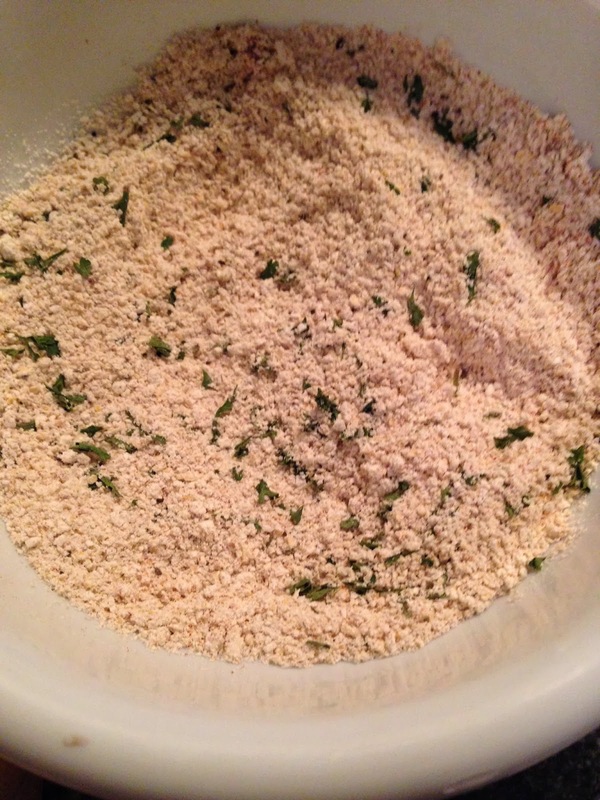 -In a small/medium bowl, mix the oat flour with the salt, pepper, paprika, garlic powder, and parsley. 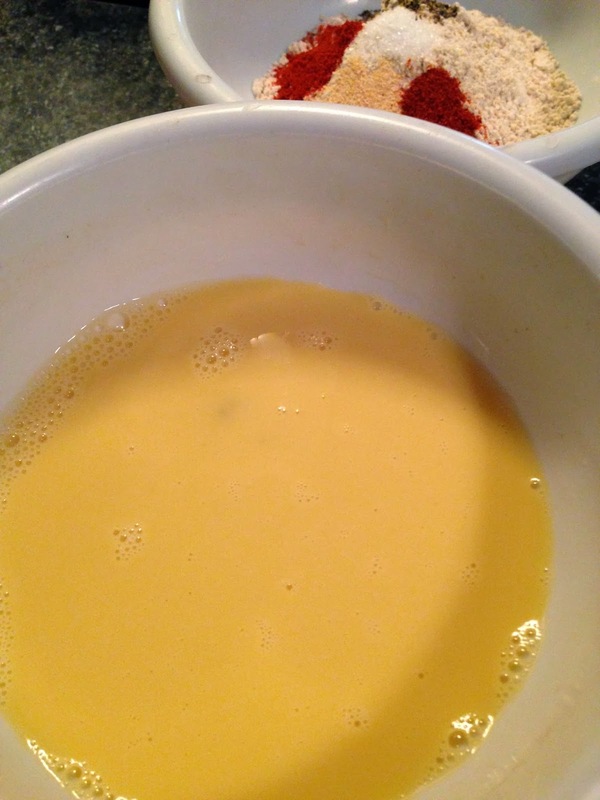 -In another small/medium bowl, whisk the egg with 1/4 cup milk until smooth. -Pour enough olive oil into a heavy-bottomed skillet (cast iron preferable) to cover the bottom of the pan. Heat over medium high heat until very hot, at least 5 minutes. Make sure it's hot enough before you put your chicken in by tossing a small crumb in: if it sizzles, you're good to go. 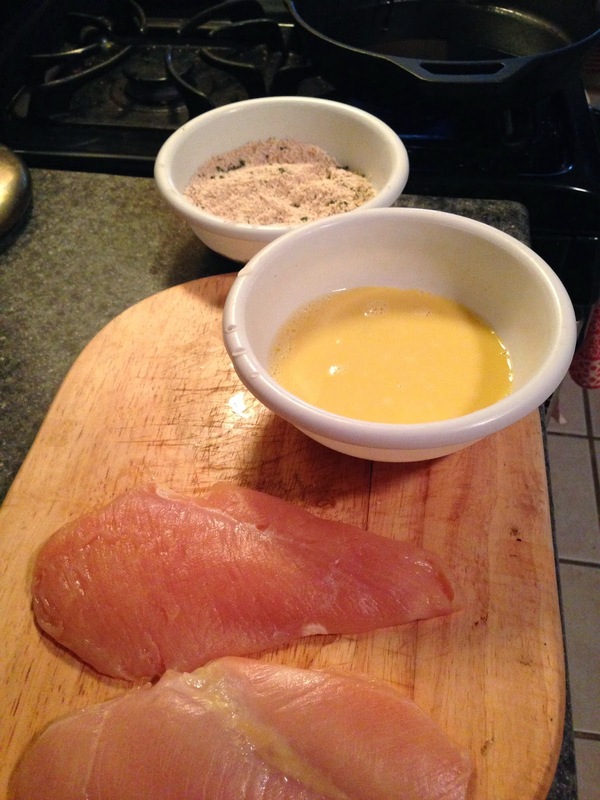 -Take each chicken breast and first coat with the oat flour. Then, dredge with the egg and milk mixture until covered. Then, return to the oat flour and coat well. Place in the hot oil. Repeat with other breast. -Cook the chicken until browned on the first side, about 5 minutes. Don't touch while it's cooking! Then, flip and cook until browned on the other side and cooked through, another 4-5 minutes. -Remove from heat and place on a paper towel. 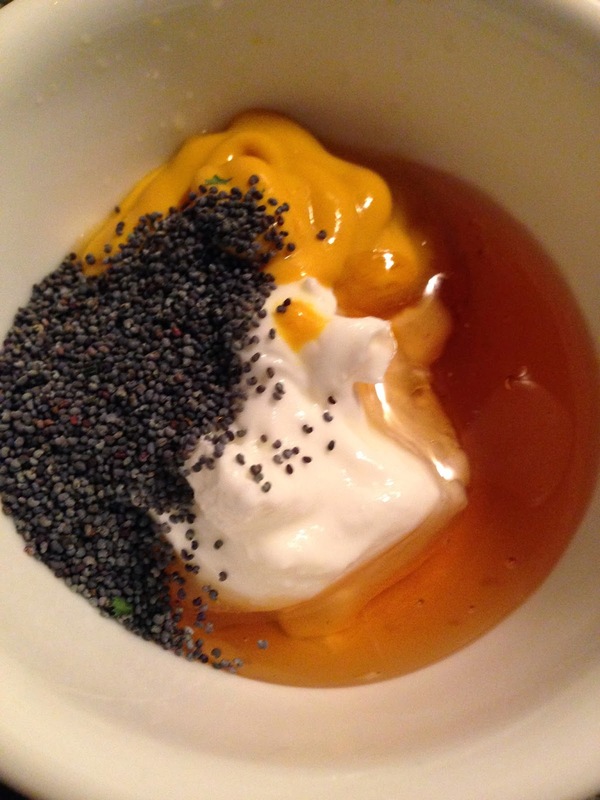 -For the sauce, whisk together the yogurt, mustard, honey, and poppyseeds. Then, slowly pour in 1 to 2 tbsp almond milk until desired consistency is reached. Drizzle over the chicken breasts and serve immediately. TAYLOR!!!! This looks incredible!!! and I have everything at home to make this (for tomorrow!). Pinning. I NEED THIS. Trying this tonight!! Can't wait! I don't actually have any greek yogurt at the moment -but I do have light sour cream. That should be a good alternative, right? Light sour cream would definitely work as an alternative. Hope you enjoy it!! I made this last night! I didn't have any poppy seeds but I had everything else. It was DELISH! Thanks for the recipe. And I am pretty sure I will never buy a bottle of honey mustard again. This was fab! I just found your site while googling for recipes. I needed something different and you seem to use the same seasonings I have in my cabinet! I tried the avocado sauce tonight with pork chops and it was great! I cant wait to try this one as well!